A man who was operating a motorcycle last week is now facing a DWI charge after he caused an accident. The accident occurred in Greensboro, NC on I-40. The accident happened after the motorcycle crashed into a bus that was trying to merge onto I-40 around 8 pm. There was another passenger on the motorcycle at the time of the accident. The driver and passenger of the motorcycle were thrown off the motorcycle during the collision. 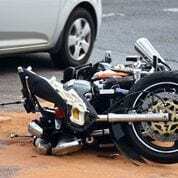 The driver of the motorcycle had to be hospitalized with serious injury. The passenger suffered injury as well, but not as serious as the driver. Neither the driver nor passenger sustained life-threatening injuries. There were 51 passengers on the bus that was hit, none of whom were injured in the accident. The driver of the motorcycle now faces a DWI and driving while license revoked charge. If you should find yourself in a situation where you have been charged with a DWI you need to contact an attorney who has the experience and knowledge necessary to handle your case with the care it deserves. For a private, confidential consultation with one of our experienced DWI lawyers, pat Robert J. Reeves, P.C. call 704-499-9000 or toll-free 877-374-5999 for more information or visit our main page here. Connect with Robert J. Reeves P.C.